Fountain Green (population approximately 200) is located in upper-western Illinois in the east-central area of Hancock County. County Highways 17 and 4 are the main roadways to and from Fountain Green. According to www.mapquest.com Fountain Green is four blocks from east to west and three blocks from north to south. 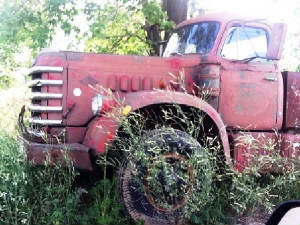 The town of Fountain Green is about 10 miles northeast of Carthage and 20 miles west of Macomb. A nice history of the town and township of Fountain Green can be viewed on the Wikipedia web page address of http://en.wikipedia.org/wiki/Fountain_Green,_Illinois . A brief summary of this article states that the area of Fountain Green was first settled in the 1830s. A church was established there in 1850. The railroad also laid tracks through the area. Fountain Green prospered for a short while due to the mining of "Black Thunder" coal in the area. The town slowly faded to its current population once the mines were closed. the town of Fountain Green supported a very successful school system as well. 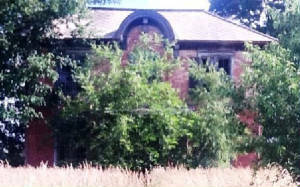 It was likely that the first schools were built in the late 1800s. "A Carthage newspaper of August 27, 1930 states that the Fountain Green High School opened on August 25th for its ninth term with a larger enrollment than the last two years. The Fountain Green High School offers only a three year course. The principal is Lester E. Foote and the assistant principal is Hollis Melvin." 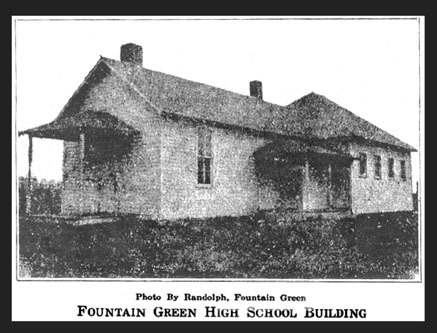 We know through the above mentioned page that Fountain Green High School was closed after the 1947-48 school year. Students of Fountain Green were then sent to nearby Blandinsville to attend high school. Later the students joined the LaHarpe school district. The students today attend Carthage Illini West High School. The Fountain Green High School building that was built in 1939 burned down in 1958. We are certain that the Fountain Green High School boys competed against other schools in the area in the sport of basketball. It is quite possible that baseball and track were offered as well. School team nickname, uniform colors, fight song, coach's names, and team records are all items were are seeking to share on this page. 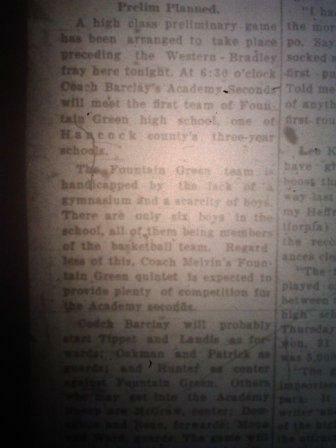 Our site author Roberta Van Briesen found the following 1923 newspaper article about the Fountain Green HS basketball team at the web address of http://hancock.ilgenweb.net/1923clips.html . "The Fountain Green High School Basket Ball team defeated the Lomax High School Basket Ball team in an out-door game at Fountain Green on November 7th, with a score of 5 to 8. Fay Yetter and Ivan Latherow played forwards on the Fountain Green squad. These boys were supported by Harlan Lenix as center and with John Larson and Fred Shipman as guards. During the last half Russell Shipman and Melvin Latherow guarded the Lomax forwards. And it was no easy job to guard Robert Pence of Lomax. Pence made all of the points for Lomax. Fay Yetter was the star player on the Fountain Green squad, making two goals in each half. The game was a very clean game and was refereed by George Hoover of Lomax. Only two fouls were called; one a personal foul on Russell Shipman of Fountain Green and one a technical foul on Clifford Pence of Lomax. The second game between these teams will probably be played at Lomax in the near future." Basket ball practice has begun on the out-door court. Equipment including suits were received this week. Several teams have written Fountain Green for games. The first game will probably be played with the Ferris high school. "A high class preliminary game has been arranged to take place preceding the Western - Bradley fray here tonight. At 6:30 o'clock Coach Barclay's Seconds will meet the First Team of Fountain Green high school, one of Hancock County's three-year schools. The Fountain Green team is handicapped by its lack of a gymnasium and a scarcity of boys. There are only six boys in the school, all of them being members of the basketball team. Regardless of this Coach Melvin's Fountain Green quintent is expected to provide plenty of competition for the Academy seconds." Further research by Beau revealed that Fountain Green High School won that night, defeating the Western Academy Second Team by a score of 14 - 13, leading 10 - 1 after the first quarter! Fountain Green did participate in the annual IHSA State Tournament. We found the following games listed on a website titled "Illinois Postseason Basketball Scores." The Basket Ball Equipment is Received. The high school has constructed a sod 150 yard circular track on the Solomon lot immediatly [sic] south of the high school building. The boys will begin training soon for the track and field meets next spring. In the center field of this track arrangements will be made for pole vaulting, jumping etc. We are certain sports were not the only item offered at Fountain Green HS. It is probable that choir, band, and many other activities made the experience of attending FGHS a rewarding one. "The play given Friday, Oct. 26, by the Fountain Green high school was well attended in spite of the rainy weather and bad roads. The gate receipts amounted to $67.40. Their seems to be a variety of opinions in regard to the calibre of this play. The play was not a humorous enough to suit a large portion of the crowd but others pronounced it to be the highest class play ever produced by the high school. Most of those attending this performance expressed themselves as being pleased with the acting and many have commented on the good memory of the players. The judges however have not expressed themselves publicly and probably will not until after the fourth play." Do You Have Information on Fountain Green High School?